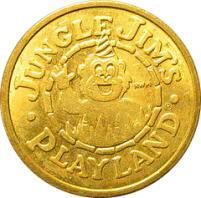 Gary found Petromyzon’s flickr account which is stocked with over 500 photos of arcade tokens. Impressive. It reminds me of when I used to deliver newspapers to a bowling alley that had a video arcade. They always paid me in quarters. The customers who came after the bowling alley got their newspaper much later than the customers who came before the bowling alley.